9to5Mac has what looks like the full inventory list of Apple's upcoming Mac product lineup that's expected to be announced at WWDC. It includes the price of every product and shows over a dozen updated computers. Basically, this list shows that the the entire Mac lineup will be receiving updates. 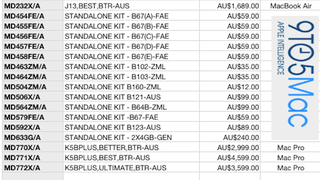 The inventory list is in Australian dollars which means it's not an exact dollar-to-dollar conversion (though it's really close, 1 AUD is .988 USD), especially because Aussie Apple Store prices are generally higher across the board but the price could be looked at relative to its current cost. For example, the current baseline iMac in Australia is $1399 AUD ($1199 in the US store), the inventory list prices the upcoming one at $1349. Could there be a price drop? Or are we reading the tea leaves too closely? Other than that, the inventory list shows new MacBook Airs, MacBook Pros, iMacs and Mac Pros with prices matching up its current cost. As for the other part numbers, MacRumors points to the 'K31' item as a possible updated AirPort Express.